Germany's Foreign Minister warns Israel against building in Judea and Samaria, says doing so could fuel conflict in the region. 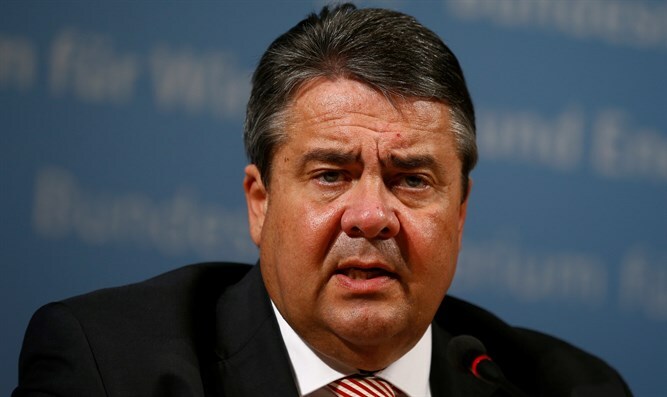 Germany's Foreign Minister, Sigmar Gabriel, on Thursday warned that building more Jewish communities in Judea and Samaria could end the prospect of a “two-state solution” and fuel conflict in the region. "We are concerned that unlimited construction of settlements will ... make a two-state solution impossible and could increase the risks of conflicts in the Middle East, including possible war," Gabriel told reporters, according to the Reuters news agency. Gabriel added that Germany would continue to advocate a two-state solution for the Israeli-Palestinian Arab conflict, saying it is "the only realistic option to reduce conflict in the region and prevent the emergency of a new war". His comments come following the meeting on Wednesday between President Donald Trump and Prime Minister Binyamin Netanyahu, during which Trump would not commit to the two-state solution as the only way to solve the conflict. "I'm looking at two-state and one-state, and I like the one that both parties like. I'm very happy with the one that both parties like. I can live with either one," Trump said. Gabriel also criticized the recently approved Regulation Law in Israel, which legalizes and protects thousands of Jewish homes in Judea and Samaria which were built with government backing and lacked absentee land claims, but against which there are now property claims. According to Reuters, Gabriel said the law further complicates the situation. The Regulation Law has been met with international criticism from, among others, the UN, France, and the European Union (EU). Following its approval, Germany postponed a summit with Israel planned for later this year.